Imagine your dream kitchen, one where money and space is no object and you can have as many or as few gadgets as you want – what would be the must-have appliances that would be found in it? Before writing this, I spoke to a group of friends and asked them about what they considered to be their essential kitchen appliances. The first response of everyone I spoke to was a surprising one – out of all the items they could have chosen, everyone said that their number one essential item was a kettle. Not a food processor, a blender or an all-singing, all-dancing coffee maker, but a simple kettle! Obviously a person’s need for a cup of tea is as all-consuming as people say it is! But, once we moved past the kettle, my friends gave some interesting suggestions about what they considered to be essential. What was clear was that their answers depended very much on their lifestyle and the needs of their families. Nearly everyone owned stick blender, citing their ease of use, practicality and flexibility as a reason to have one. Another must have electric cooking device was a stand mixer. 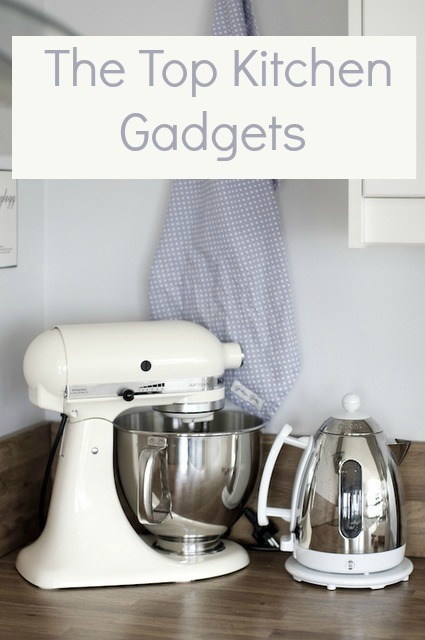 These are not only great-looking kitchen appliances which look fantastic displayed on your counter-tops, but they are also an invaluable time-saving aid if, like me, you do a lot of baking. A final suggestion was a good coffee maker. If you are serious about your coffee and spend a lot of money buying from coffee shops, then a good coffee maker at home is a sensible buy. Add an insulated mug to your list and you can make your commuting coffee before you leave the house, saving you time and money on the way to work.